The last few days I spent some time re-watching the IM Live Kona Coverage .. both to “run the numbers” and also to validate my initial impressions. I loved the Kona race and the coverage, but I also think that it could be so much better – both for hard-core fans and casual observers of our sport. It’s important to me to start by saying that in my opinion the commentators Michael Lovato, Matt Lieto and Greg Welch did a decent job. While they are the “public faces” (or voices) of the coverage and usually the first target for criticism, they have to work within constraints that they can’t easily influence themselves. Of course there is room for improvement (some suggestions below), but I’ll take “not 100% politically correct” banter between Mike and Matt over “corporate PR-speak by trained communication people” any day. I have not done a specific analysis of what was talked about during the race, but it’s probably fair to say that the commentators focused for the majority of time on the men’s race when there was a split screen. I don’t think the Ads were too bad (even if the blocks were often five to eight minutes long), especially since there often was a split screen that showed what was going on in the race (though again, mostly focused on the men’s race). It’s the “price to pay” for receiving free coverage, and I don’t have a problem with that. Showing the women’s race but talking about the men’s race seemed much more common than the other way around. Towards the end of the coverage, things appeared to be a bit rushed. While all Top 10 male finishers were pictured and acknowledged crossing the finish line, the women finishing 7th to 10th were not shown (Piampiano, Lundstroem) or just “in the background” (Gossage, Lester). 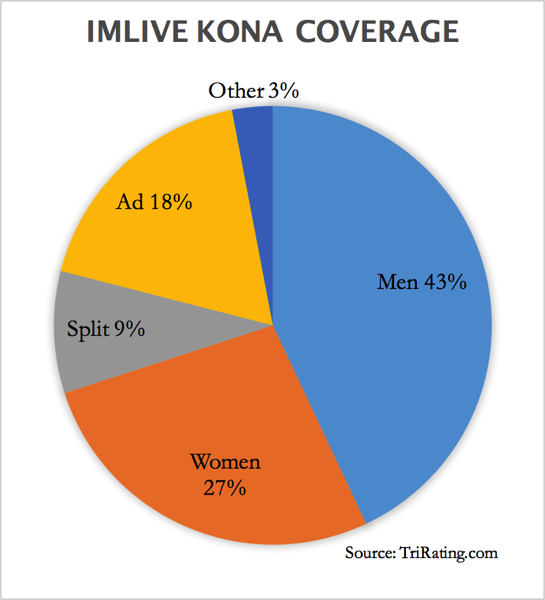 I may be a bit biased, but this year the data coverage of the Kona race took a large step backwards. At the start of the 2015 season Ironman announced improved coverage for their big races, including a new website and GPS coverage of the races. For example, last year there was a constantly updated GPS Leaderboard that showed at any time where all the Pros in the race were and how large the time gaps between all the athletes were. This year there was only a semi-secret website with “dots on a map”, but no leaderboard with time differences – all the splits in the live blog or on the IM Live coverage were from timing mats or from the spotter network – clearly not good enough for this time and age! It would make following Pros that can’t be shown in the coverage much easier. It would make the job of the commentators much easier .. no need to speculate on who might be where in the race. You could have a “race situation display”, like they are showing for the Tour de France coverage (leaders/size of front group – time difference to first chasers – time difference to next chasers etc. ), giving viewers who took a break a chance for a quick catch-up. The lack of a GPS Leaderboard was especially frustrating since it was available last year. Hopefully Ironman can bring it back for next year’s coverage! A number of times something happened in the picture that was completely ignored by the commentators. One example that stuck in my mind was a Pro athlete (I think it was Jan Van Berkel) in T2 who was being attended by medical staff – no mention while the picture was shown, no update on his status (Jan is okay and already looking for new challenges). Ideally there’d be more cameras so it gets easier to show more than just the leaders, in the meantime there needs to be more information about how the race is shaping up: How large is the front group, who is being dropped from the front group, what chase groups are there, who received a penalty or had a flat etc. – information that would be easily available with a GPS Leaderboard. It must be frustrating for the commentators that they have to rely on the same information that’s available to dedicated viewers such as the picture that’s shown, the live blog and timing splits – again a GPS Leaderboard would help. It would also be great if the commentators collected more information about the athletes in the race such as their strengths and weaknesses, previous results, and “soft facts” and stories about them. This might be a small issue, but the design of the split screen results uses very little of the screen. Even though two streams are shown, only 30% of the available space is used to show the race – the rest is occupied by the background (56%), a static “2016 IRONMAN WORLD CHAMPIONSHIP” header (10%) and two race clocks. As far as I can tell there was only one short recap (showing what happened in the swim). For those that are not watching the complete coverage you could show a quick recap at regular times (e.g. on the full hour) of what has happened so far and what the race situation currently is. Often the commentators seemed surprised by changing camera views, having to come up with something interesting to say on the spot, not being able to finish their thoughts to comment on something new, or continuing their discussion even when something completely different was shown. This could be much better either if the commentators could choose between different views at the time it fits or of they have tighter integration with the person who makes these changes. I’m not an experienced “media person”, so I’m not sure how much of this is possible, but I think that most of these suggestions do not necessarily require major changes or spending a ton of money. 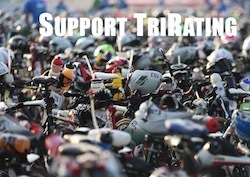 I’d love to see improved coverage for next year’s Kona race!